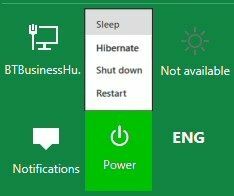 How to save power in Windows 8 by enabling Hybrid sleep mode? Home / PC Tuning / How to save power in Windows 8 by enabling Hybrid sleep mode? Windows 8 is the newest and most advanced operating system so far. Microsoft has won millions of new members into their famous windows trademark with this one of a kind operating system. This new operating system has so many new changes to add to the excitement. This changes include a new Start Menu via the Metro Start Screen, the tiles and the all new and improved user interface. We have looked at so much about Windows 8 in all the previous articles. In this articles we will be looking at the procedure of enabling hybrid sleep mode in helping to save up power. Procedure of using Hybrid Sleep mode to save power in Windows 8. Procedure-1: Using the Power Option. Press the Windows Key to access the start screen and hence press Windows Key + W to open the Search Charm. In the search text area type Power and press Enter. A number of results will appear so simply click on Power Option. A new window titled Power Option will appear with all the power options for Windows 8. From the left side of the window click on Choose what the power buttons do. The next options that appear will enable you to customize you system into either sleeping when you press the power button or sleeping when you close the lid of your laptop. Procedure- 2: Using the Battery icon in the taskbar. Another way of enabling and configuring Hybrid Sleep is through the power icon on the right side of the taskbar. Right click the Battery icon on the taskbar and select Power Options. This will take you back to the Power Options window. This time on your current power plan select Change plan settings. In the window that appears click on the Change advanced power settings. Navigate through the options given under the new Power options window and click on Sleep to open up more options. Then click on Allow hybrid sleep. New options will appear showing whether this feature was turned On or Off. If off click on either On battery or Plugged in a drop down menu appears where you can change the Plan settings for hybrid sleep to on. Click Apply then Ok then reboot to put the settings into action. That’s it so if you wish to enable hybrid sleep mode then follow the above stipulated procedures .Thank you for reading my article. Fenix Raw belongs to technical industry, willing to share his valuable ideas. Our exclusively prepared MB7-700 exam preparation material is quite handy for your success in MB6-889 exam. Take the benefit or our preparation material and derive the better end results.